‘Worst-ever!’, ‘in living memory’, ‘highest on record!’, ‘unprecedented!’. These phrases, used often by newsreaders on the main networks including Sky and BBC, always set an alarm bell ringing in my head. None more so than weather stories which, with the stormy winter we’ve just had, has been happening almost daily since the middle of December. As the winter has progressed the networks have tried to out do one another with the severity-value of a story. What starts with a reporter gingerly standing by the side of a flooded field within days changes to the reporter, donning a pair of fisherman’s waders, trawling waist-deep through a flooded Berkshire housing estate. The media also seem to delight in rushing out Met Office data to proclaim these armageddon scenarios before the season is over and the statistics can be properly studied, absorbed and commented upon. Last summer, I started to build a dataset for my own area – Wanstead. Using local figures from the City of London Cemetery I was able to take the daily series back to 1959. Beyond this I then sourced monthly data for Greenwich, 6 miles away, back to 1881. Using W.A.L Marshall’s A Century of London Weather and Luke Howard’s The Climate of London enabled me to take the series right back to 1797. The series makes for interesting reading, putting this winter as 6th wettest since 1797. Scientists would say that because my series is only one dataset it cannot be regarded as a ‘catch-all’ for the country overall. But when statements like “England and Wales has had its heaviest rainfall since 1766” are put out by the media it is blatantly not true for the entire country. 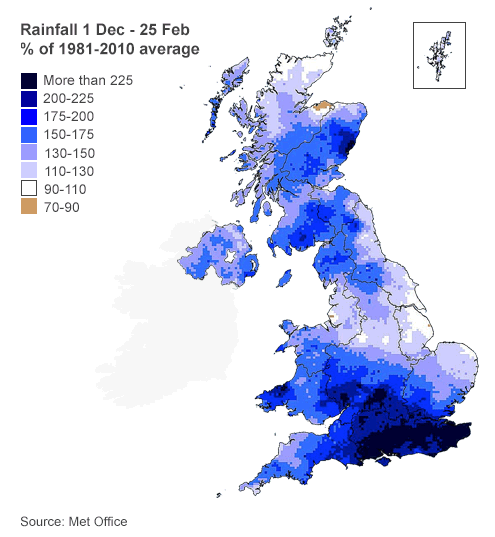 Just a quick look at the map shows that while parts of south and southeast England have been very wet – other parts of the country have been much less so. But in this age of 24-hour rolling news the message to anyone who takes the headlines at face value is that this has been the wettest winter ever. You can view the winter mean temperature and rainfall stats here. Although February was wet it was relatively much dryer than January and calmer than the other two months. February often brings us our best snowfalls and coldest weather but this was completely absent this year, continuing the theme of a snowless December and January. Some 69.9mm of rain (178% of average) fell in February – the wettest since 2010 – and 32nd wettest in the series back to 1797. February was also warmer than average with a mean temperature of 7.5C (2.2C above the 30-year average) – ranking it 13th in the series since 1797 – and the warmest January since 2011. Though the month was very mild no single day was particularly mild. Highest maximum was 14.5C on the 24th. The most notable day was a storm on the evening of Valentine’s Day into the 15th which saw yet more damage, resulting in two deaths including a man killed by a wave on a cruise ship in the Channel. A woman was killed when a 3ft by 3ft block of falling masonry crushed her car outside Holborn station. Rain, rain and more rain. Winter 2013/14 will be most remembered for its incessant precipitation that brought flooding to many parts of the country including the Somerset Levels and many towns and villages along the Thames. 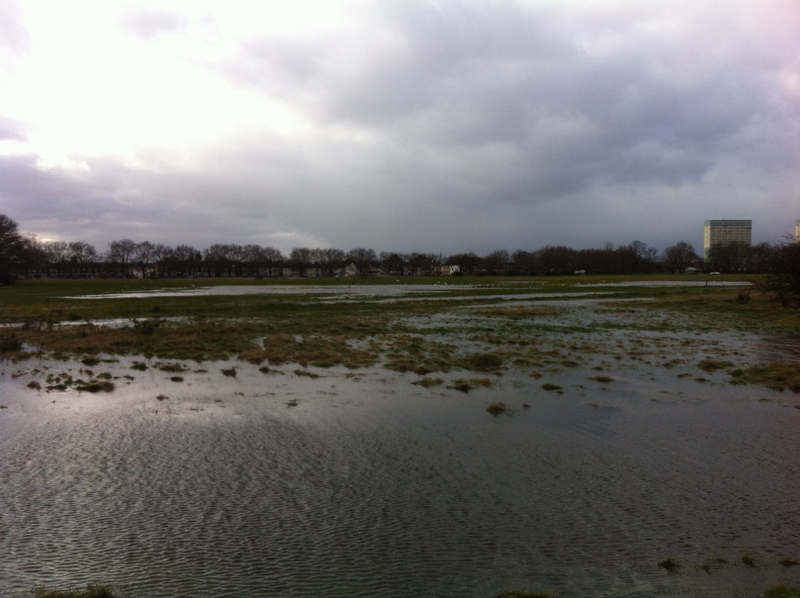 But, in this locality, it was no record breaker – being only the 6th wettest in my series going back to 1797. The mean temperature of 6.7C made it the 10th mildest, a full degree colder than the warmest winter of 1989/90. The winter was notable for its complete lack of lying and falling snow. Indeed NO snow falling was observed for the entire three months – something that hasn’t happened in this area in at least 50 years – possibly longer. There’s still a chance of snowfall before April’s out – the snowfall season can last from November to May – but with the increasing strength of the sun any snow cover will be short-lived. The opening few days of December were calm and quiet but a storm on 5th caused two deaths and much damage in the north; a tidal surge in the North Sea brought flooding along the east coast. The coldest spell of the winter arrived the second week of December with fog and a couple of frosts. From the 15th, however, the Atlantic cranked into life and pretty much drove the weather for the whole winter. A strong jetstream stayed over or very close to the UK for much of the three months, driving depression after depression over the British Isles. Though daily totals were not record-breaking it was noticeable how much heavier the rain was at times across the Thames. A storm that ran from December 23rd into Christmas Eve brought 23.4mm of rain to Wanstead while at Kenley, 17.5 miles away, over four times as much was recorded. The intense streamer of rain and high winds brought power cuts to Gatwick airport, delaying thousands of travellers on their way home for Christmas. Five people were killed as a result of the storm. The wet theme continued through January with added thunder and lightning. The most notable day was Saturday 25th when what started as a bright, fine day quickly changed around 4pm as a strong squall with heavy rain blew through with associated thunder and lightning and 6C fall in temperature in an hour. Wanstead escaped the damage of elsewhere. 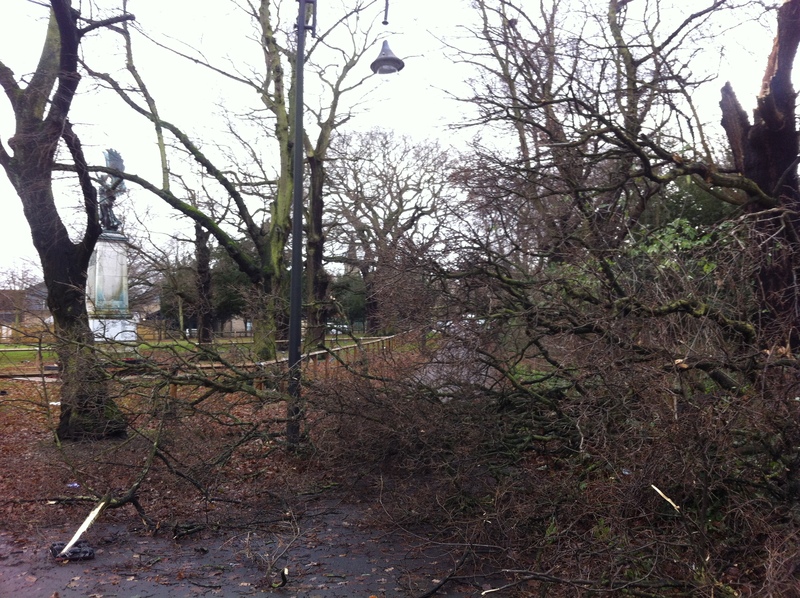 Numerous trees blocked rail lines in Kent and gusts of over 60mph were widely reported. Yet more rain greeted the month of February though things turned somewhat dryer after 15th, though rainfall for this month was still over 180% of normal. A storm on the evening of Valentine’s Day into 15th saw yet more damage, resulting in two deaths including a man killed by a wave on a cruise ship in the Channel. A woman was killed when a 3ft by 3ft block of falling masonry crushed her car outside Holborn station.